With a well-worn and electric studio chemistry, Bay Area icons J. Stalin and Dj.Fresh have collaborated for a long list hard-hitting albums. Reuniting for their 9th and 10th albums, Stalin and Dj.Fresh share Miracle & Nightmare on 10th Street Part 2. 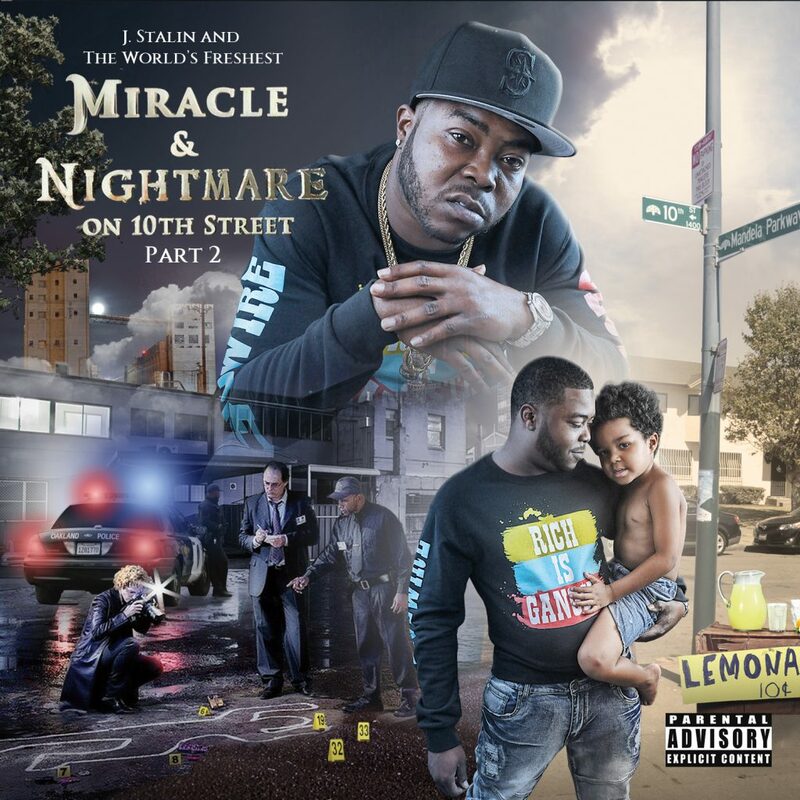 The sequel to Fresh and Stalin’s Miracle & Nightmare on 10th Street, which reached #28 on the Billboard Heatseekers chart upon its release in 2013, Part 2 spans two 10-track discs, each organized on the the nightmare and miracle of life in Stalin’s neighborhood in Oaktown. Packed with detailed street stories, creative brags and threats, and memorable turns-of-phrase, Miracle & Nightmare on 10th Street Part 2 brims with electricity, as Dj.Fresh provides a bright electro-funk backdrop for the Miracle disc and an aggressive, bass-heavy mob soundscape for the Nightmare disc. Prior to the album’s release, Stalin shared the sinister and violent “Nightmare on 10th Street Returns,” which kicks off the Nightmare disc, and “Living Lavish,” a luxurious, HYPEBEAST-premiered ode to the good life from the Miracle disc. The upcoming album boasts a quintessentially Bay Area guestlist, with appearances from Beeda Weeda, Shady Nate, Juneonnabeat, Mitchy Slick, and other East Bay stalwarts. The follow-up to Stalin’s Tears of Joy 2, released earlier in 2018,and following Dj.Fresh’s 2018 collaborations with Rydah J Klyde, Jay Worthy, and Zion I, Miracle & Nightmare on 10th Street releases via Livewire/EMPIRE. To accompany the release of the album, Stalin shares the video for “Nightmare on 10th Street Returns” via an XXL premiere. Filmed through a dark and grainy filter, the new video mimics the horror and uncertainty of life in the hood. Rocking a bowler hat and a red-and-black striped sweater, imitating the iconic look of Nightmare on Elm Street villain Freddie Krueger, as he prepares to bury a body in the California desert. Beginning with a glorious instrumental synth intro, showing off the musical chops of Dj.Fresh, “Nightmare On 10th Street Returns” is the ideal intro for the album, illustrating the rough life in West Oakland and Stalin’s struggles to make a better life for his wife and son.